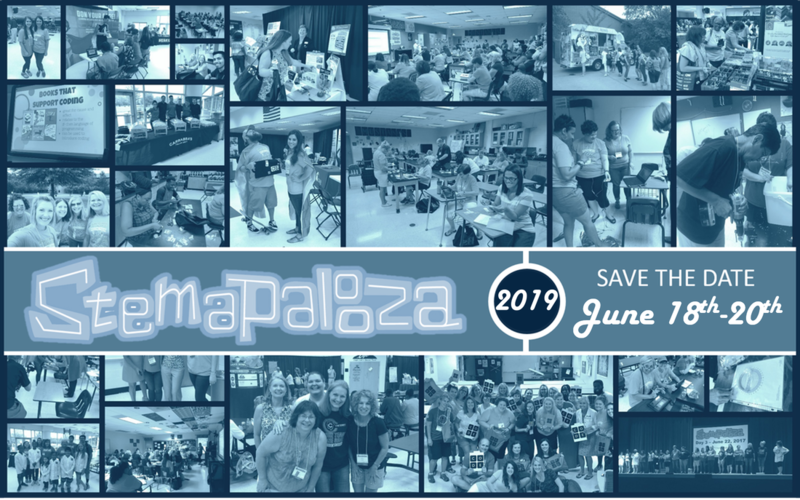 ​Join us for the 4th Annual STEMapalooza summer conference at Kennesaw Mountain High School. We will have over 500 educators, administrators and exhibitors from across the state participating. There is something for everyone. Follow us on Twitter and check out #STEMCobb and #STEMapalooza. Lunch provided to all attendees daily. Thanks to a generous sponsor, STEMapalooza is FREE for all attendees, both in and outside of Cobb! We hope you'll join us! ​Please fill out this form if you're interested in being notified when registration for our pre-conference workshops (June 17th) becomes available (early May). We will be offering half-day and full-day workshops on topics such as AR/VR, 3D Printing, Code.org, MinecraftEDU, and Lego's STEAM Park & Coding Express! You DON'T want to miss out! Want your child to experience STEM the same time as you? Check out this STEM camp offered for grades 3-5 students June 17-20! ​We would love to have your company/organization represented at our 2019 summer STEM Conference. Our goal is to showcase exciting and relevant resources and tools that will benefit teachers and students, while inspiring rich learning experiences in the METRO Atlanta area. While there is no fee for you to secure a spot, we ask that you bring a minimum of $50 in gift cards ($5-$10 each) to various locations (QT, Starbucks, Chick-fil-a, Target, etc.). These will be given as door prizes to attendees throughout the event. Feel free to bring additional door prizes for attendees as well. There are a number of event sponsorship opportunities available. Please reach out to Sally Creel, sally.creel@cobbk12.org if you're interested in sponsoring lunch, snack, or materials for this event.